Finding ways to DIY equipment, supplies, and other aspects of the aquarium hobby is not only a huge money saver, it’s also satisfying and fun (at least for me)! The following is a collection of simple, cost-effective DIY projects that have saved me a ton of time, money, and/or effort. This one isn’t so much a DIY project as a cheap replacement material. Instead of spending big ol’ bucks at the pet store buying filter floss, go down to Walmart or your other local craft store and pick up some quilt batting. I use the Poly-Fil Extra-Loft Quilt Batting. It’s super cheap and works well for mechanical filtration. If you get a different brand, be sure it hasn’t been treated with any kind of chemical additives for things like fire resistance, antibacterial, etc. Another material replacement, rather than true DIY. Black aquarium sand can run at the insanely expensive rate of $1-$2 (or more) per pound. A fantastic-looking alternative is Black Diamond Blasting Media. It’s black, inert, and comes in a variety of grit sizes… and you can get 50 pounds for less than $10! I buy mine at the Tractor Supply Company. Different people have reported different experiences with this sand. I find that the 20-40 grit (which I bought first) is pretty jagged, and I’d be afraid to use it with loaches, cory cats, or other bottom feeders. The finer 30-60 grit, though, is wonderful. My loaches sift it through their gills constantly, and I haven’t seen any adverse effects. Some people have complained of an oily residue on the surface of the water when the sand is new, but I haven’t had a problem with this. There’s a little sheen on the surface, but it hasn’t affected fish health and is easy enough to skim off anyway. One person on FishLore says that over time, aluminum or other metals might actually leach out of the sand in tiny quantities; these could potentially accumulate to the point that it might affect fish health. This sand might not be the best choice for Walstad tanks, where water changes are few and far between, for that reason… but in normal tanks with regular water changes, I don’t believe it would ever be a concern. 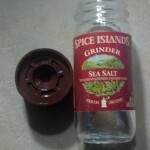 For pellets: use a sea salt grinder to grind up pellets that are too large for small fish. A pepper mill works too, but a sea salt grinder is easier to clean the salt out of: just run water through it and let the salt dissolve. For freeze-dried foods or flakes: get an empty spice shaker and put in some marbles, large gravel, or other hard objects that are too large to fit through the shaker holes. Add the food you want crushed and shake vigorously.